Pierce Koch turned in a masterful shutout performance vs. Seward a week ago to stop a four-game losing streak by the Albion Cornerstone Legion Seniors. Last Tuesday, June 11, Koch actually outdid himself. Not only did the righthander record a second straight shutout to extend a four-game Cornerstone win streak, he fired a seven inning one-hitter in the process. Although Koch wasn’t quite perfect in his effort, he needed to string zeroes throughout, as Albion Cornerstone managed just a single run off Norfolk’s Michael Obermiller in a 1-0 victory at Leon Nelson Memorial Field at the Albion Sports Complex. In a classic pitcher’s dual not often seen at the American Legion level, Koch and Obermiller matched scoreboard goose eggs until Albion broke through with a run on three hits in the bottom of the fifth inning. Koch allowed seven baserunners, but only two after a shaky second inning – a fifth-inning walk and Andrew Eisenbraun’s single in the seventh. 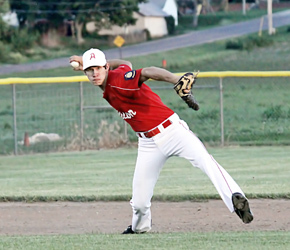 Albion Cornerstone hosted Aurora Wednesday, June 19, in the second of back-to-back midweek games, riding their second four-game winning streak of the season. That string of success was halted, however, as the visitors used two multi-run innings and the pitching of Tanner Griffith to thump Albion 12-0. Aurora got to business from the start, batting around in the top of the first and taking a 4-0 lead before Albion Cornerstone (8-5) had a turn at the plate.